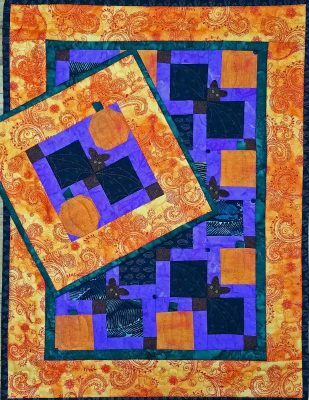 Join Jilly as she shares with you another great miniature quilt. Included with the class is the pattern. Once the class is over the pattern will be available for purchase. Chubby pumpkins and a silly little bat (or, bats—depending on your choices) make for a happy and colorful Halloween. Dimensional ears and pumpkin stems, snowball blocks and #8 beads turn a nine patch into a pumpkin patch. Class is for the smaller quilt, but there is a materials list included for the larger quilt as well. You could turn the top pumpkin into a full moon by using a moon color instead of orange and omitting the pumpkin stem.